Mmm…yak bits. So some of the details on this page are a little gross, but I really wanted to convey the yak getting blown to bits, fleshy chunks and all. As always, I went back and forth on whether to include sound effects or not. I thought a really big “Kakooom!” or something would really help sell it, but every iteration I tried laying in just seemed to cover up too much of the artwork. 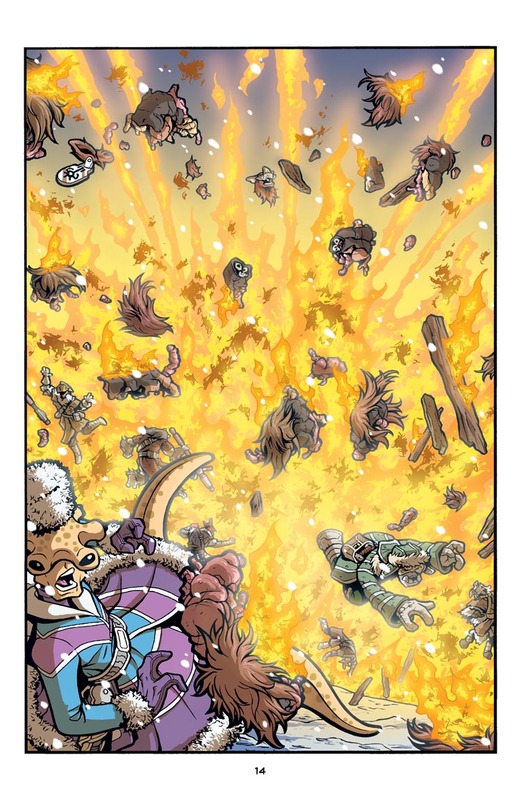 And the sound effect then became the main focal point of the page instead of the actual artwork of the explosion. So in the end, I opted to leave it out. I dunno, I think an explosion that takes up the entire page conveys itself just fine. I don’t think it really needs any more selling. re: Special Effects – IMO a >boom< can work if it's at a subtle layer underneath the explosive bits. I get the feeling that everyone would be deaf before the explosion finished anyway. Just what I was thinking. No sound, your eardrums would be blown out. I find this page to be the perfect mix of dramatic explosions and hilarious yak bits. I’m sure Cember would agree. It reminds me of a certain scene from Ghostbusters. Kung Pow Yak. Yum, yum. Somebody pass the Sriracha sauce.